On New Year’s Eve, protesters attempted to follow through on their promise after approximately 75 demonstrators affiliated with the activist group Ferguson Action gathered at police headquarters, and some attempted to storm the building. Around two dozen people were charged with various offenses related to the action, one of a series in the city protesting the August 9 shooting of Michael Brown in the St Louis suburb of Ferguson. Up north in New York, around 100 protesters descended on the city’s iconic Times Square, where Mayor Bill de Blasio and his family led the annual ball drop. The marchers failed, however, to get onto the square due to sheer number of people celebrating in the area. Police affirmed their right to protest, though they were warned the marchers they could be arrested for “disorderly conduct” if they didn’t stay on the sidewalks. Just over 200 miles east in Boston, activists staged a “die in” the city’s Copley Square late Wednesday afternoon, just before major festivities got underway. Several dozen people briefly laid down in the plaza in front of the Boston Public Library, while others held signs saying "Black Lives Matter" and "a young black man is two times more likely to be shot dead by police than a young white man,"' the local CBS affiliate reported. Boston's Mayor Marty Walsh and Police Commissioner William Evans had failed in their pleas that the activists not interrupt the city’s “family friendly” New Year’s Eve festivities with the protest. Similar protests were held in Atlanta, Cleveland, Detroit and Houston. Out on the West Coast, the largest such march was held in Oakland, California, where up to 200 people are estimated to have marched against excessive police force. Protesters converged at Frank Ogawa Plaza in Oakland – the primary protest encampment for the 2011 Occupy Oakland movement – at around 9pm local time before heading south down the main thoroughfare of Broadway. Some of the marchers attempted to hold a noise demo, in which voices, sound systems, musical instruments and fireworks are used as a means to get the message out. Protesters noted a heavy police presence, with cordons being set up around the march route to keep marchers from venturing out into the city. According to social media reports, some protesters lobbed bottles at the police, sparking minor clashes. There are estimates that 15 people were arrested, although those numbers have not been confirmed. A similar protest was held across the bay in San Francisco, where around 100 people gathered at the Embarcadero Bay Area Rapid Transit (BART) station on Market Street. Police said one person was shot in the foot on Market Street, though it remains unclear if the shooting was connected with the demonstration, the Bay City News Service reported. Police also kept close the marchers, with NBC Bay Area footage showing officers flanking the marchers as the marched through the streets. Many in attendance recalled the BART Police shooting of Oscar Grant. Grant, who was commuting from San Francisco to Oakland on early on New Year’s Day 2009, was shot in the back while lying face down on the platform following an altercation with police. A grand jury’s decision not to indict Officer Darren Wilson in the shooting death of Ferguson, Missouri teen Michael Brown last month sparked a nationwide protest movement against excessive police force. Just over a week later, a grand jury in Staten Island opted not to indict New York Police in the chokehold death of Eric Garner, bringing the slogan “I can’t breathe” to national attention. 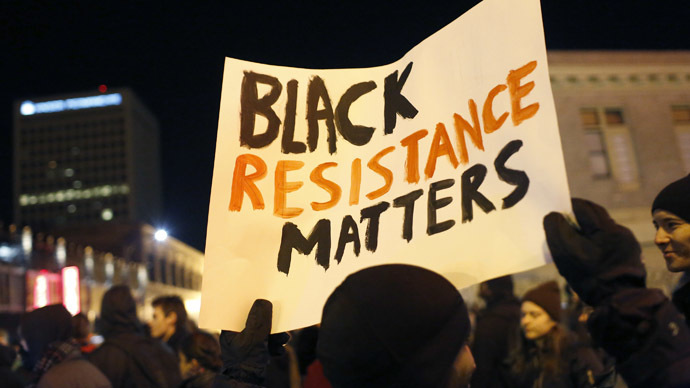 The movement has inspired similar protests against police brutality abroad.